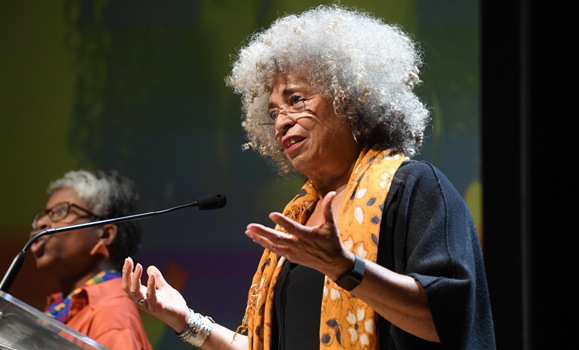 On Tuesday night in Dalhousie’s Rebecca Cohn Auditorium, iconic African-American activist and scholar Angela Davis discussed the structural nature of oppression, the need to build community and the multigenerational struggle for change. Dr. Davis’s Belong Forum, part of Dal 200’s Year of Belonging lecture series, was a special one, and not just because of the headline speaker’s international renown. It also involved Dr. Davis receiving an honorary degree from Dalhousie — the highest honour the university can bestow. And it marked the inaugural Viola Desmond Legacy Lecture, the start of a four-year marquee lecture series celebrating diversity and inclusiveness. Appropriately, a significant portion of the capacity crowd was from the African-Nova Scotian community and diaspora. 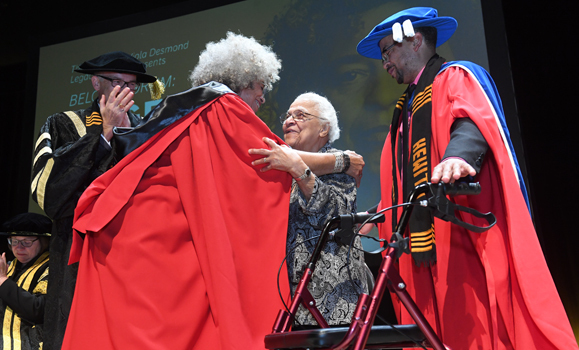 The presence of Dr. Davis, who over six decades has fought racism and oppression of all kinds, made for a particularly emotional and meaningful evening. 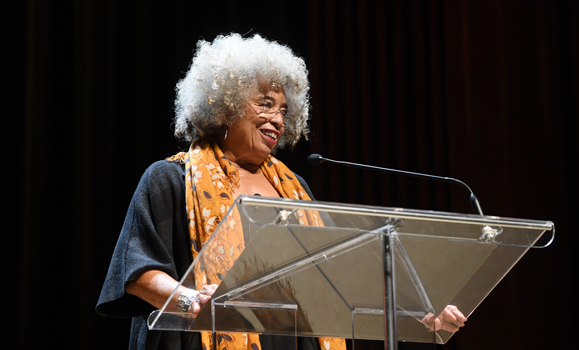 The night featured Mayann Francis as its MC — the first African Nova Scotian to serve as the province’s Lieutenant Governor, and who said she never would have believed she’d get the chance to meet Angela Davis. Legendary a cappella quartet Four the Moment reunited to perform songs honouring Black women. Artist, poet, author and Dal English Professor Shauntay Grant performed two powerful spoken-word pieces, including one based on the African proverb, “Until lions have historians, hunters will be heroes.” All were visibly moved and acknowledged the honour it was to perform. The evening's master of ceremonies. Delvina Bernard, Kimberley Bernard, Andrea Currie and Anne-Marie Woods. Accompanied by: Silvio Pupo, Wayn Hamilton, Mahalia Smith, Reeny Smith and Micah Smith. But it was the impact of Dr. Davis’s presence that stood out among all the great moments. As Agassou Jones, son of civil rights champion Rocky Jones, told Dr. Davis, “You being here means a whole lot to our community” — a sentiment made abundantly clear as Kevin Hewitt, chair of the Dalhousie Senate, delivered the citation speech for her honorary degree. Dr. Hewitt had to collect himself several times as he listed Dr. Davis’s efforts in the struggle, including the fact she was placed on the FBI’s Ten Most Wanted list and spent 18 months in prison. “She stood among the giants of the civil rights movement,” said Dr. Hewitt. One of the night’s many standing ovations was given to Wanda Robson, sister of Viola Desmond — the lecture series’ namesake. Desmond was infamously convicted of tax evasion as punishment for refusing to change seats in a segregated New Glasgow movie theatre in 1946 and became a civil rights icon. Robson helped present Dr. Davis with a kente sash as part of her honorary degree ceremony. Much of Dr. Davis’s lecture focused on a shift over the decades from pointing fingers at violent individuals toward a structural understanding of oppression — that it is embedded in our institutions and perpetuated by powerful states and entities. To create a sense of belonging among the oppressed requires creating a world worth belonging to. Dr. Davis asked her audience to consider the “10 million people who are officially ostracized”: people in prison, who have been “divested of their basic civil rights.” She noted the disproportionate numbers of Black, Indigenous, people from the global south, and people with disabilities in prisons, and said that they were never given opportunities to belong. The problem with diversity initiatives, she said, is that they assume excluded people must “genuflect to the institutions that excluded them.” In other words: the onus is on the oppressed rather than the oppressor. Recognizing the deep structural nature of racism, she said, also means recognizing gender violence as pandemic and as everyone’s problem. “Gender violence is a male problem,” she said. “Gun violence is a feminist issue.” She called for a movement of conscious men and groups of men organized against sexualized violence. Conversely, change does not mean simply putting women or people of colour in positions of power if they merely replicate the same structures. The institutions themselves must be scrutinized as well. For example, she said, any campaign for equality in the military “must be accompanied by a deep critique of the military itself.” Similarly, when struggling for equal marriage rights, we should reconsider the institution of marriage itself. Intersectionality — the consideration of where different identities and the accompanying discrimination against them overlap — is essential here, she said, advocating for a feminism that recognizes, for example, that water is a human right everywhere, from Flint Michigan to Standing Rock to Palestine. During the Q&A session hosted by Paul Kennedy of CBC (a Dal 200 sponsor), students and community members spoke of their own anti-racist work and personal struggles dealing with racism at Dalhousie. Dr. Davis spoke of the importance of community, saying that the work cannot succeed, and can even be dangerous, if done alone. “It is our responsibility to engage in these struggles while recognizing what a difficult process it is,” Dr. Davis said, noting that activists can sometimes expect overnight change when, in fact, it can often be frustratingly slow. Sometimes it feels like a lot has changed and little has changed at all at the same time. The key, she noted, is to “leave traces of our commitment to radical change,” so that the struggle may continue after the individual is gone. The evening concluded with thank-you remarks from Marko Simmonds and Katrina Jarvis and a reception featuring a performance by Drummers from Home. 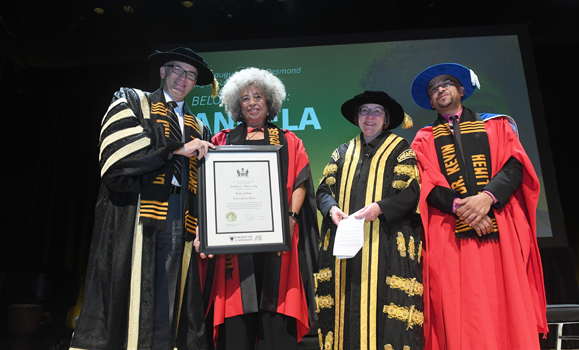 Angela Davis receives her honorary degree. Left to right: President Richard Florizone, Dr. Davis, Chancellor Anne McLellan, Senate Chair Kevin Hewitt. 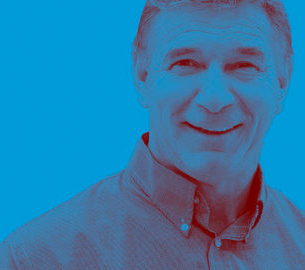 Dal 200's Belong Forum series concludes next week on Thursday, October 25 with disability activist and Paralympian Rick Hansen. Best known as the “Man in Motion,” Rick has dedicated his life to changing attitudes and removing barriers for people with disabilities. He’ll discuss how we can create an inclusive world where people with disabilities are living to their full potential. His free lecture takes place at 7 p.m. in the Student Union Building's McInnes Room. Register on Eventbrite.